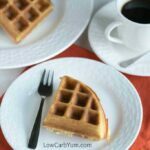 Scrumptious low carb paleo coconut flour waffles are easy to make. 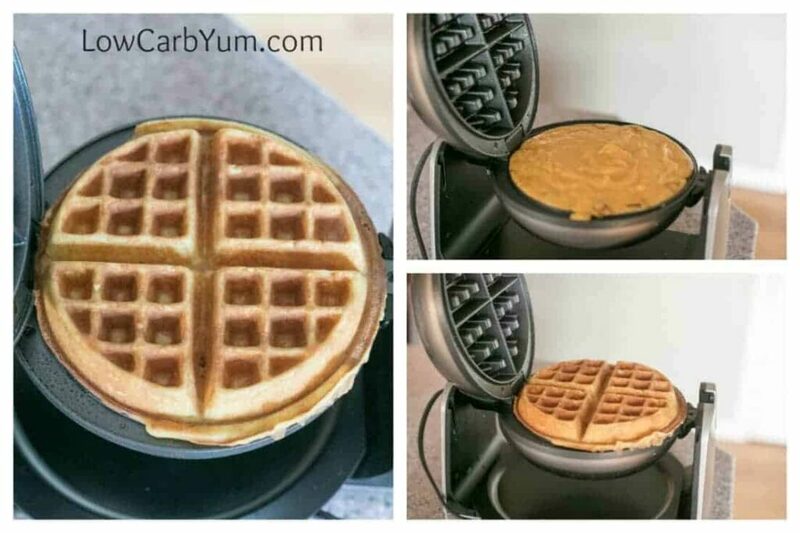 Just mix up the ingredients in a blender then pour in a Belgian waffle maker. We flew into Orlando, Florida yesterday evening. Today is our first full day of vacation. My son is on his spring break from Prep School and we are spending the week together down south. To celebrate his successful wrestling season as a first year high school freshman, I offered to take him on the trip. He won a couple big championship tournaments over the last month. It’s always tough during the season because you have to maintain weight. So, he’s happy to be eating whatever he wants now. Belgian waffles are one of my son’s favorite breakfast items. 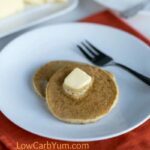 I asked him to try these low carb paleo coconut flour waffles. I made them in our Belgian style waffle maker. 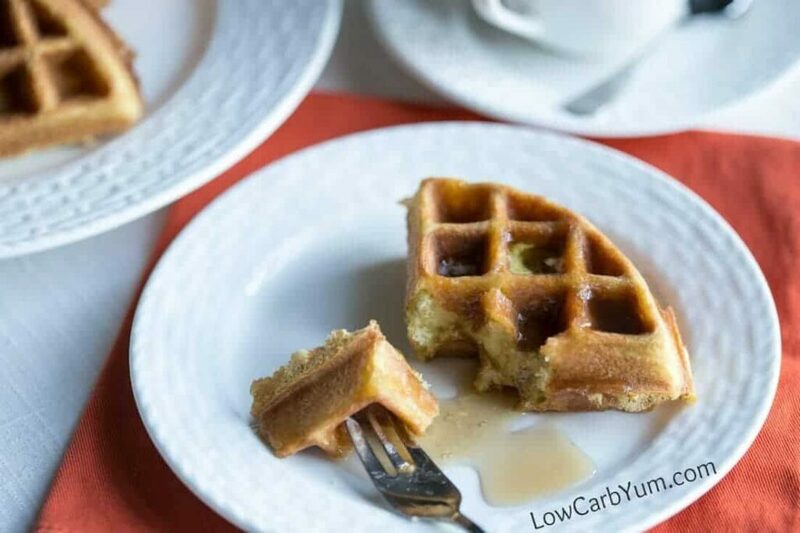 My son gave these low carb gluten free waffles a thumbs up. Although he’s not a picky eater like my daughter, the fact that he liked them is makes it a winning recipe. I just started to use coconut flour. 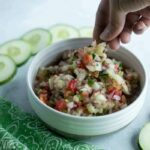 It can give some items a somewhat coconut flavor. But, I don’t find it that noticeable. In my opinion, it gives a better texture than almond flour. 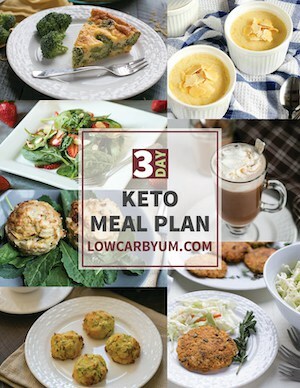 This is a recipe I found at The Good Eatah Blog. 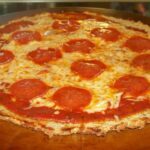 There, you will find a lot of great gluten-free and casein-free recipes. They aren’t sugar-free so I modified the coconut flour waffles to better fit low carb. Liz, the blogger at The Good Eatah, gives the great tip of using a blender to mix the batter. This is because coconut flour does tend to clump up when it gets wet. 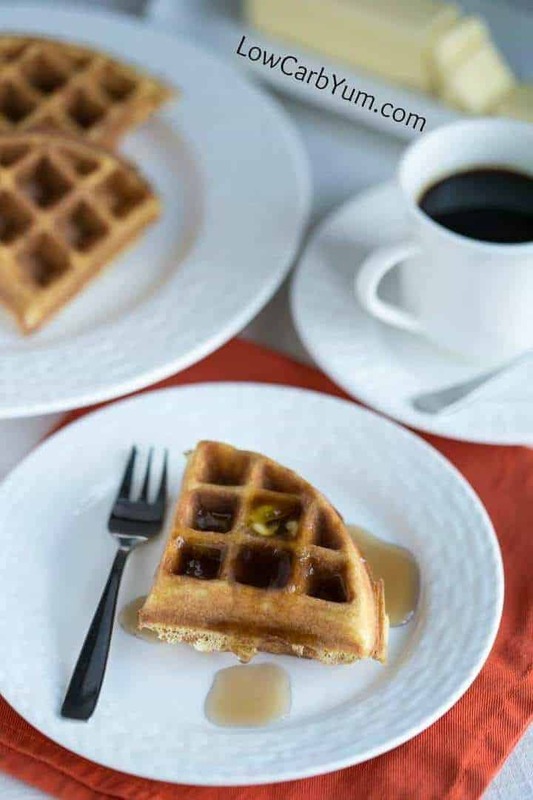 The blender works out perfect in this recipe because the batter can be poured directly into the waffle iron once mixed. My Belgian style low carb waffles were very large because I have a thick belgian waffle maker. I got one full waffles from this recipe. For me, one serving was a quarter of the whole waffle. 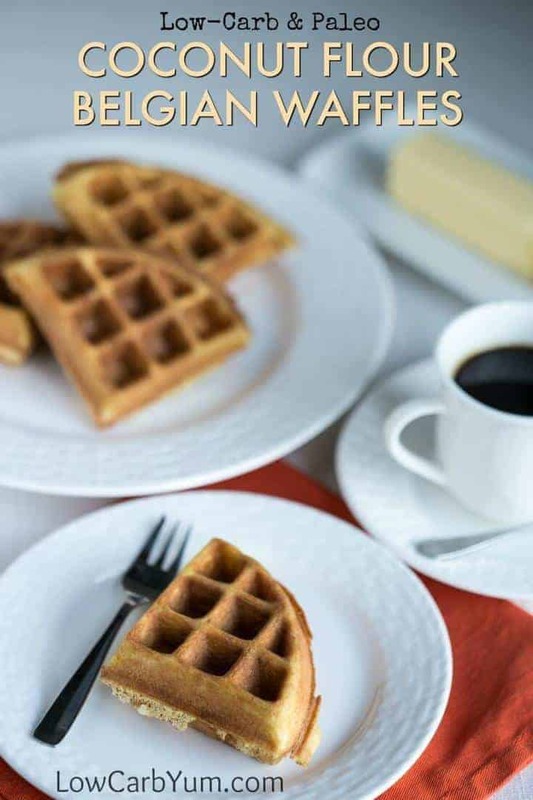 You can also cook these coconut flour waffles in a standard waffle maker. However, I really like the thicker Belgian style. And, this recipe worked out perfectly for me in the round shape. For those who like to make things ahead, you’ll love that these low carb waffles freeze well. Just make up a big batch, cut them in quarters, and wrap each separately before freezing. 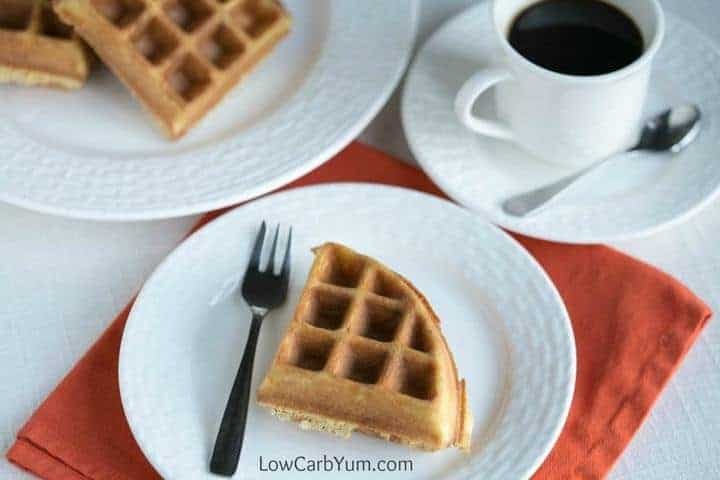 These thick low carb gluten free Belgian style waffles are also perfect for desserts. I love to top them with a blueberry or strawberry syrup. Then, I finish it off with some whipped cream. You can also make a yummy waffle sundae. 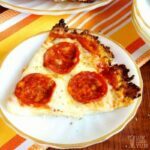 Just top a quarter slice with low carb ice cream and your favorite toppings. The waffle sundae was super popular at the ice cream parlor I worked at while in college. Any way you eat these yummy coconut flour waffles will be a hit. 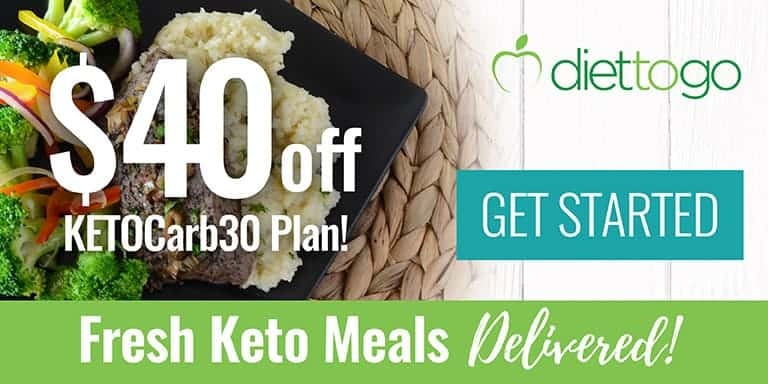 And, you’ll never miss the sugar or carbs. Coconut flour does have a natural sweetness to it. However, I added a little stevia liquid concentrate to the batter to enhance the flavor. 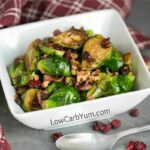 All of the ingredients in the recipe are paleo friendly if you use ghee instead of butter. Coconut oil would also work if you don’t have any ghee. They also make a butter flavored coconut oil so you don’t lose that buttery flavor. 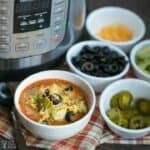 I’m always looking for an easy breakfast to take along to work. These little waffle treats are perfect for taking on the go. We like these paleo waffles better than the coconut flour pancake recipe. I may need to tweak this recipe some to make a goo pancake recipe. 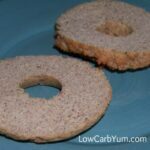 What low carb flour do you prefer? 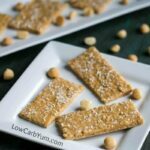 Is it coconut or almond flour? Not sure? Click here for an article that compares the two. 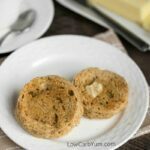 These delicious low carb coconut flour Belgian waffles are very close to the real thing and they are gluten free. Just mix up the ingredients in a blender. 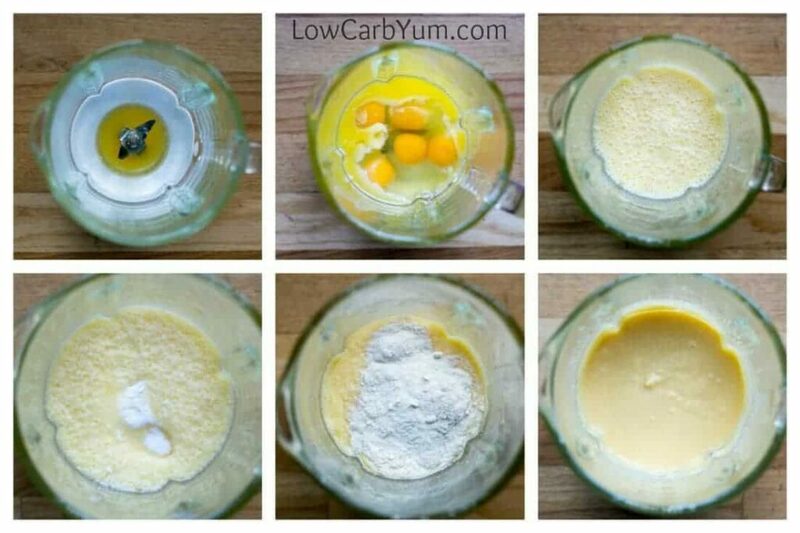 In a blender, mix the butter and eggs until combined thoroughly. Add the stevia, salt and baking powder and mix to combine. 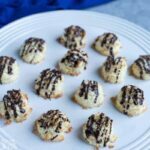 Mix in the coconut flour until completely combined without any lumps. Let the batter sit for at least five minutes so it can thicken. May add in a little water if desired to thin the batter. Cook according to waffle maker instructions. Coconut oil may also be used in place of the butter or ghee.